Crowdsourced news service Blottr just launched an iPhone app called Paparappzi and will release a version for Android devices next week. The app allows users to write a news item and upload it with an attached photo and geotag. Blottr launched last August and encourages contributers to cover issues relevant to their local communities. So far, the site focuses on seven cities in England, including Birmingham, Bristol, Cardiff, Edinburgh, Leeds, London, and Manchester. On a grander scale, a new site called Meporter launched a few weeks ago in several countries, including the United States, the U.K., China, Australia, Japan, Spain, and Italy. User contributions include breaking news in addition to reviews for local establishments. Meporter also has some Foursquare-ish features, such as a badge system. CEO and founder Andy Leff says that he is already in discussion with other publishers about incorporating Meporter content into their programs. “News outlets are losing readers because they can’t cover everything,” he said. 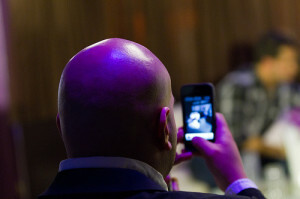 Smartphones and other mobile devices currently on the market already add to the renewed boom in crowdsourced reporting. Imagine the possibilities that will arrive in the future! Take, for example, a patent first filed in the first quarter of 2010, but was just recently reported by Patently Apple, a blog that analyzes Apple’s patent applications. Jae Han Lee and E-Cheng Chang have invented two potential iPhone features, referred to as “report” and “interview” modes. The changes involve implementing front- and rear-facing cameras with corresponding front- and rear-facing microphones. The iPhone would switch automatically between video streams by detecting lip movements or the direction of sound. The video could then be broadcast as is or cleaned up through further editing processes later. Patently Apple‘s blogmaster, Jack Purcher, refers specifically to CNN’s iReport throughout his article, but the new features would be a great boon to citizen journalists of all sorts. It would be greatly beneficial to professional reporters as well, particularly those in more remote locations and/or dangerous situations. The typical on-location news interview setup has a lone cameraman, simple sound-recording gear and a single journalist — which means fill-in shots have to be recorded separately to show the interviewer as well as interviewee. Apple’s realized its twin-cam devices actually boost the power of a lone journalist to simultaneously record their target on video and the target audio, all while also capturing fill-in shots with a picture-in-picture interface. Sure makes video editing on the fly easier. Image by yago1.com (Yago Veith), used under its Creative Commons license.